"American AncesTREES is a new, FREE online family tree experience for American Ancestors members. 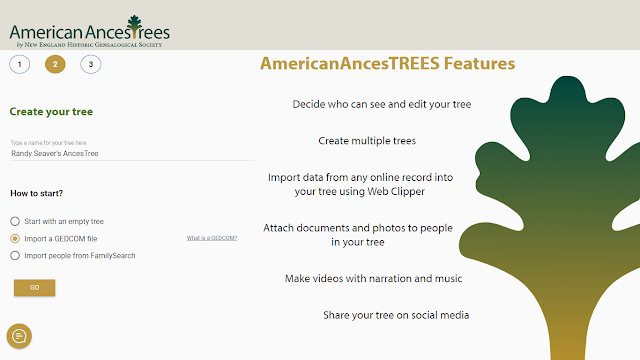 Members can create a tree from scratch, import an existing family tree, get hints to "grow" trees, and use social media features to share trees with friends and family. Higher-level plans with additional features such as DNA tools are available at a low cost. Make sure you're logged into our site and get started today! " 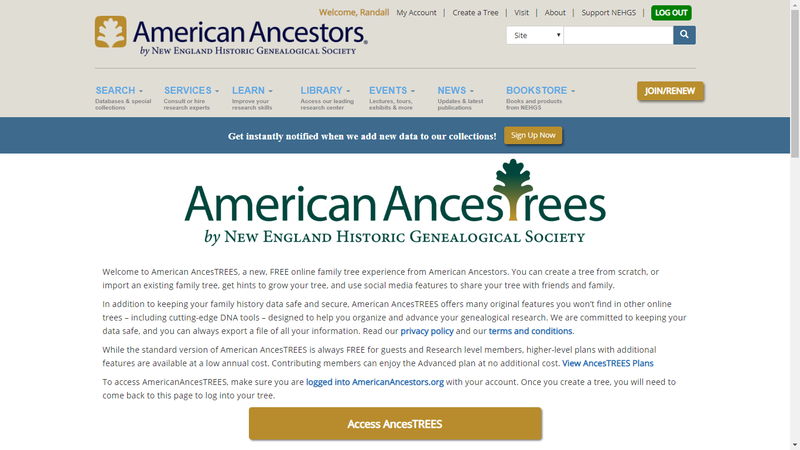 You can't keep me away from a family tree site, and I am an NEHGS/AmericanAncestors member, so I immediately decided to add my content to it. 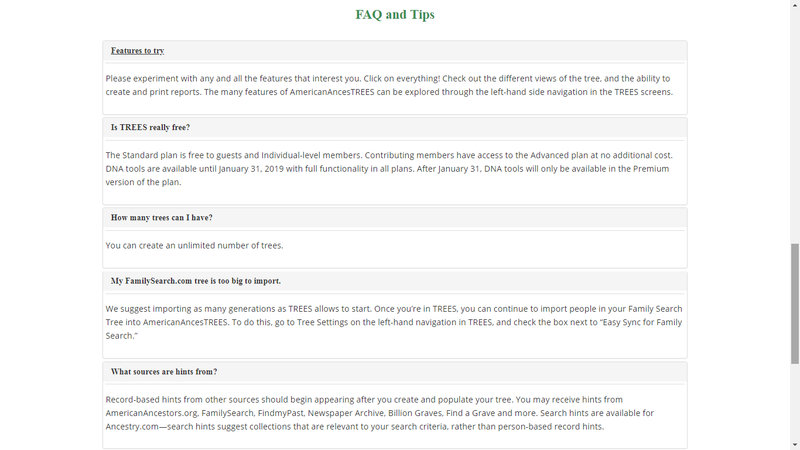 The three tree plans provide different features. 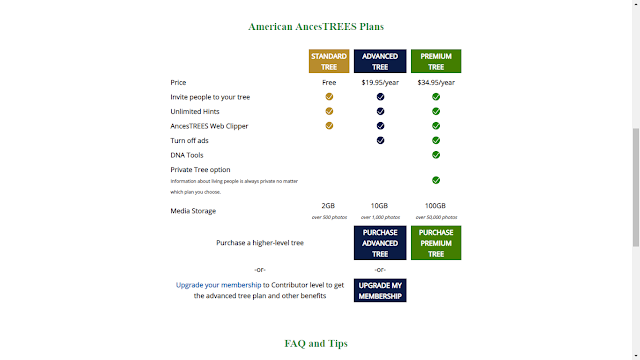 The DNA Tools and Private Tree options require a Premium plan. 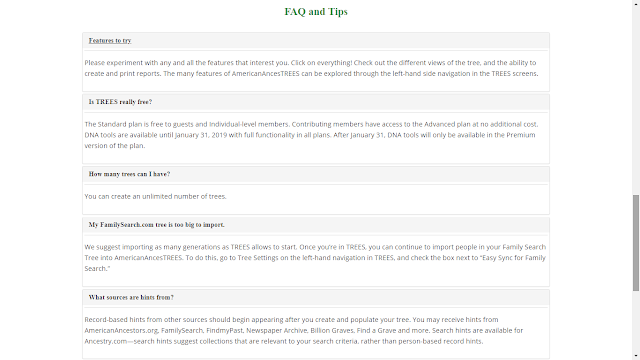 3) Further down the page, there is a set of "Frequently Asked Questions:"
I chose a creative name for my tree ("Randy Seaver's AncesTree") and decided I would "Import a GEDCOM file" (the other two options are to "Start with an empty tree" and "Import people from FamilySearch." 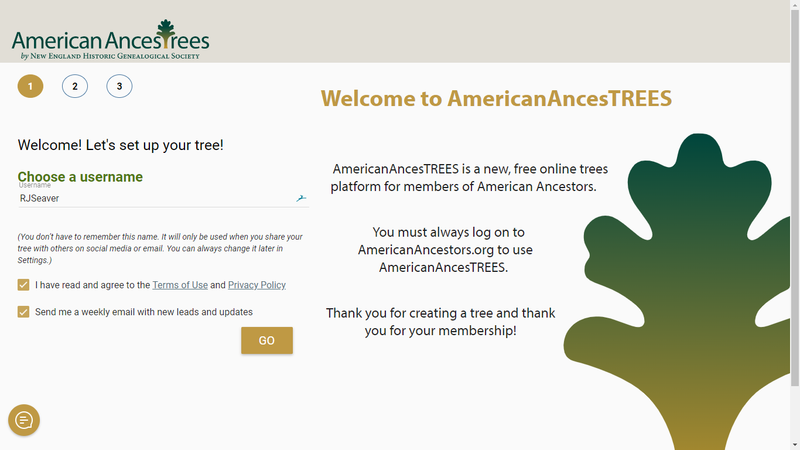 My guess is that if I start with an empty tree, that I will have to enter profiles one at a time by hand. On this screen, I can "Import a GEDCOM" file to populate my AncesTree. I have to "Choose File" and then identify the Root person of the tree. There is a note - "GEDCOMs up to 75,000 people and up to 75 Mb are supported." 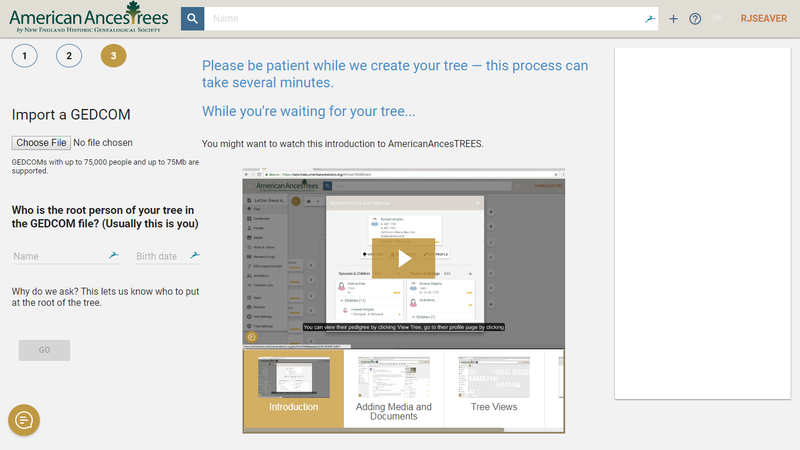 5) My RootsMagic tree is around 52,000 persons and I don't know how many Mb, so I will stop here and make a GEDCOM file from my RootsMagic file. This report will continue in a separate post after I work with my GEDCOM file. Disclosure: I am a longtime annual subscriber (1992?) of NEHGS/AmericanAncestors, and have received no material considerations from them ever. I am quite interested in this new feature. I have been an off and on member of NEHGS over the years. I haven’t always found their records useful so I don’t always renew. But, this has me intrigued. Thanks Randy.